Reedbeds are an area of water or marshland that is dominated by reeds. They are a part of a healthy river system, providing excellent habitat for fish, invertebrates and birds to live in. They are also great natural filters, removing pollutants whilst oxygenating the water. Reedbeds are extremely important habitats for wildlife, birds, invertebrates and mammals. Kingfisher and heron are commonly seen in and around the Lea Navigation reedbeds as well as swans, coots, and moorhens which can be seen nesting and bringing up their young from the shelter of the reedbed. Elsewhere in the UK, more than 700 invertebrates have been recorded on reedbeds, including dragonflies and damselflies. Reedbeds oxygenate. This benefits aquatic life such as fish. During severe pollution incidents, the oxygen in the river decreases rapidly. Reedbeds are a refuge to escape such incidents. 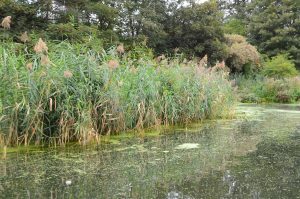 Reedbeds tackle pollution in water by converting toxic ammonia into nitrate, which is less harmful. 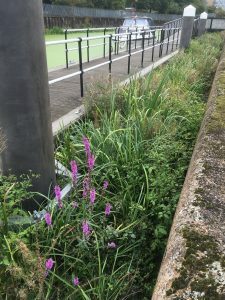 As the water quality of the Lea Navigation is poor and receives pollution daily from a variety of sources reedbeds are a great way of naturally improving the water quality. 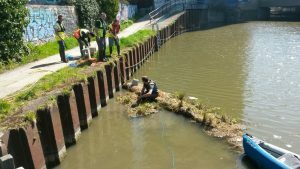 As part of our ongoing Love the Lea Programme to engage the local community to help improve the rivers of the Lea Catchment, we have introduced 600 metres of new reedbeds into the Lea Navigation, with plans to expand this work to more sites along this river. If you’re interested in funding a reedbed, please get in touch with Ben Fenton. The Lea Navigation is a canalised section of London’s second river the Lea. 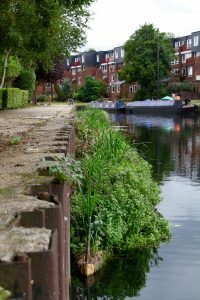 It flows from the countryside of Hertfordshire to Bow Locks in East London, dissecting the North and East London. Traditional reedbeds: the Common Reed (Phragmites) planted into the river bed. Floating reedbeds: in areas where it is difficult, or not permitted to create a reedbed planted into the river bed, floating reedbeds can be used. The roots of the plants hang into the water, meaning increased surface area for tackling pollution. List of funders: HSBC Water Programme, Thames Water, Environment Agency, London Legacy Development Corporation, Tower Hill Trust, Tesco Bags of Help, Alpkit Foundation. The map below shows the locations of reedbeds that we have installed so far, as well as the sites where we plan to install a reedbed in future.